6:15 AM - Oh my gourds, is that the fragging alarm? Already? Please, no. But of course it is. And if I stay in bed, things will go very badly. So I'm up, checking my e-mail, trying to make my brain work, all of that. 6:30 AM - Wake up the big dude. The little dude is sick, so I tell him he can stay in bed. Make breakfast and lunch for big dude and the man. Iron a shirt for the man. Catch a glimpse of myself in the mirror and resolve to start doing better with the hair (which is now officially a mane) and the face. 7:20 AM - Take big dude to school. Drop him off in car line. And then sit in the traffic that is heading to the highway. I hate traffic. But at least I don't have to get on the fragging highway. 7:45 AM - Back home again, sending the man off and getting in some quality snuggling time with the sick little dude. (Probably not my best plan, but oh well). The rest of the morning is spent transcribing written homework to typed, so I can e-mail it in and hope the professor gives me the points. Also try to negotiate a make up test for the one I'm missing today. How come kids always get sick on test days? So I type, and I plurk, and I bemoan the fact that I don't have a solid business plan. 11:45 AM - Fix chicken noodle soup for me and the little dude, and watch some cartoons with him. Play some rush hour with him, and reskein and photograph some yarn. Oh holy hand grenades! How on earth is it time to pick up the boy? 2:30 PM - Head to school to pick up boy. Little dude is feeling better. Pick up little dude's homework and big dude. Head to Publix for 2 things and 2 things only: granola bars and sour cream. 5:30 PM - Put together dinner while I tidy up the house. Cuban black bean patties with pineapple rice - one of our favorites from when we were vegheads. The patties are formed and cooking, and the pineapple is getting all carmelized and delicious in a bit of butter. I love the way the pineapple smells while it's cooking. 6:15 PM - Realize that I did not actually turn on the rice cooker. Seriously? Why does this stuff happen to me? 6:55 PM - Finally sit down to dinner. Nearly an hour late. Fortunately the man had to work late so we sort of ate together. Of course we were all starving by then and inhaled it, but oh well. 7:30 PM - Watch a bit of Indiana Jones with the monsters while flipping through the new Cooking Light magazine. 8:15 PM - Blog my life. 8:30 PM - Clean up kitchen, tidy up office, make up a master plan for my life and the world. 'Cause it's just that easy. Oh, and maybe later I will do some googling of yarnography skills before I head to bed around 10:30 or 11. 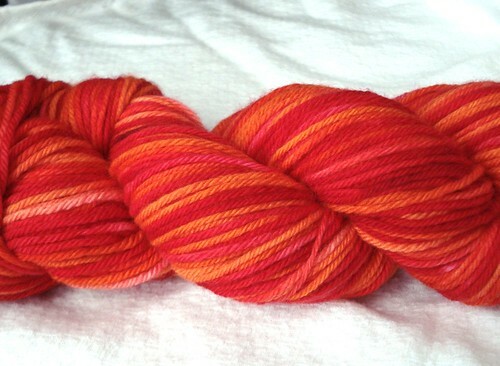 Because I can't get good pictures of my hand-dyed yarn to save my life. This took me like 10 tries!